The Opposite of A Laid Back Night at the Plastic Factory in Nagoya – and NOT to Have Been Missed! NAGOYA, Japan – And then came one of those dream nights as I love them: A combination of a fabulous stage, a fabulous sound system, a fabulous crowd, a bunch of fabulous “other” musicians, and lots of fabulous people to talk to! That describes in a (fabulous) nutshell the evening I spent at the Plastic Factory last night in Nagoya. Any regular readers of this blog will know that I have been going to the Plastic Factory annually for a few years now, but I have to say I think that was one of the top two times I spent at this very cool, in-place in Imaike, owned and run by the fabulous Heinz Senn, of Switzerland. I had to stay late at the racetrack, interview lots of people, pack in a few stories and organize my racing life. So I figured that I would not have the time to make it to the Plastic Factory, where Heinz told me that I was welcome to come, and maybe even if those who had booked the night allowed it, I would be able to play some songs. “Those” people being a group of musicians who meet at the Plastic Factory once a week, or once a month, or once in a while, to play a kind of open mic that actually consists of each of the musicians taking the stage for two or three songs and then handing it on to the next musician…. And so on until the early hours of the morning. And so it went last night, with a nice mix of expat musicians and some Japanese people in the crowd, and the wonderful Japanese harmonica player who accompanied me on “You Ain’t Goin’ Nowhere,” of Bob Dylan, and with some other musicians. In any case, I had the most amazing time, and I was so glad that once again I proved to myself that I must never take “no” for an answer to myself. I realized as I got to the Nagoya station from the Shiroko station – near Suzuka – that if I ate a horrendous fast-food meal in the Nagoya station, and if I did not go back to my hotel to pick up my guitar, then I would make it to the Plastic Factory easily in time to see much of the show – and maybe even play. And that’s what happened. The Plastic Factory is a fabulous venue with, as I said, a great stage and sound system, and on the first floor a space that is used sometimes as a gallery, sometimes for other things, and all together, it is a great meeting place for like-minded individuals looking for…great music, fun and chat. What can I say. Just check it out. And check out the videos on this page to see the variety of musicians! They call their group, I believe – writing this from memory – “The Good ‘Ole Boys.” And indeed they were. PS, and I almost forgot to mention! On the last weekend of the month, or something like that, they also have a real bona fide open mic at the Plastic Factory. 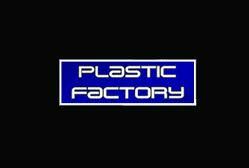 So when in town and looking for an experience, or a place to play, check out the Plastic Factory. NAGOYA, Japan – I realized last night that it was the eighth time I have played at the R&B Melrose permanent open mic in Nagoya, last night, and I will gladly return again. Later, today, I found I must have missed another open mic that I have never done before, but somehow the thought of checking Facebook never occurred to me. But little does that matter aside from the area of big experiences of life events…. The R&B Melrose is a jamming bar hors paire…. 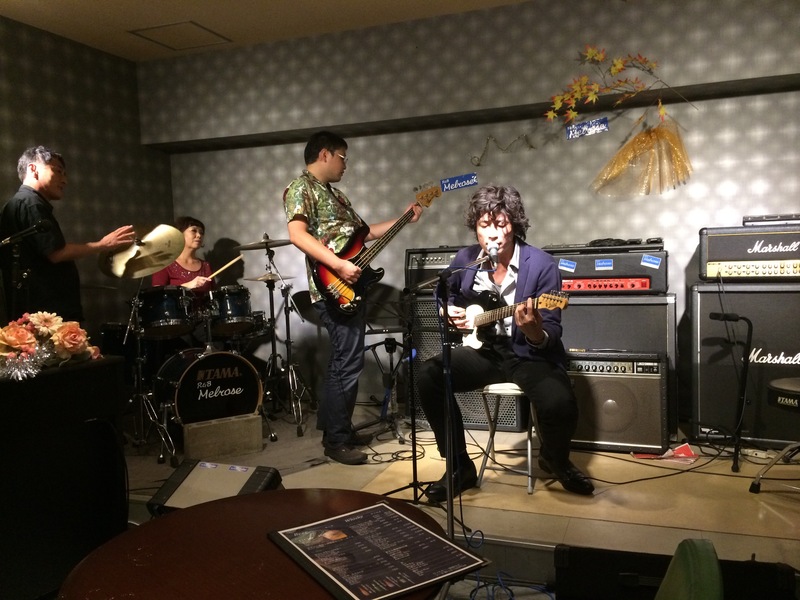 It is in the cellar room of a place in downtown Nagoya, with a fabulous little stage, the wonderful couple who run the place, and piano, drum set, acoustic and electric guitars, the Marshall amps, and the regular flow of Japanese musicians. I was feeling kind of tired last night, thanks to the ongoing tale of jet lag, and I ate a meal of a pizza and wine at a bar not so far from the R&B Melrose, and I was almost ready to go directly back to my hotel and flop over into bed. But I could not resist aother visit. And so I went, found several musicians there, even though it was not advertised as an open mic night, and I got to go up and play several times, the most fun being when I got to play with the 1973 Martin of one of the musicians – it reinforced my faith in Martin guitars…but from 1973…. I suddenly had a real feeling of the kind that I look for all around the world of sharing a bit of real life in another country far from my own with people doing what they do all the time, with no consciousness of the same thing happening elsewhere in the world, with no consciousness of the thing that draws me to this part of the world, with full consciousness of living their life rituals, into which I dip momentarily. I returned back to my hotel, found that the evening had given me enough energy to go out for a nighttime jog, and then I slept soundly for 10 hours! 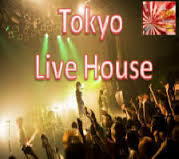 Welcome back to Japan, Nagoya and the Live House, jamming bar, permanent open mic of the R&B Melrose…. 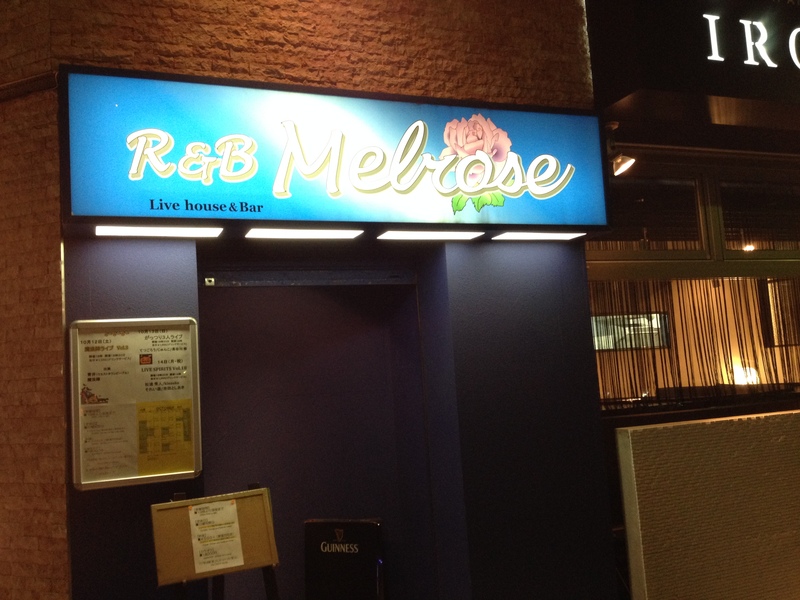 NAGOYA, Japan – It has become a tradition for me now to spend Thursday nights in Nagoya at the R&B Melrose open mic. This cellar room full of musical instruments and warmth, is one of the more laid-back and friendly open mics I know of in Japan. It is also not one of the most crowded in terms of participants…. 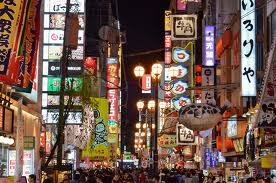 But that’s always a great way to start off my weekend in Nagoya, relaxed, low key, amongst friends. I calculated last night that it was my seventh time at the R&B Melrose – seven different years!! And it has not changed. Arrive, choose your instrument, play alone or with other clients, play what you want in terms of musical styles. Second group at the R&B Melrose open mic in Nagoya. First one at the R&B Melrose open mic in Nagoya.